Canada Soccer's newly expanded Battle of the North will feature a 13-team format when the 2019 Canadian Championship kicks off on 15 May. The 24-match schedule features Canadian teams from across five leagues culminating with the Final Round on 18 and 25 September. The five-round competition will feature teams from League1 Ontario, the Première ligue du Soccer de Québec (PLSQ), the Canadian Premier League, United Soccer League, and Major League Soccer. The Canadian Championship winner captures the Voyageurs Cup and earns Canada’s sole spot in the 2020 Scotiabank Concacaf Champions League. "The Canadian Championship has evolved into a true domestic cup competition with multiple levels of entrants all battling to secure a coveted Scotiabank Concacaf Champions League spot," said Canada Soccer President Steven Reed. "We are proud to welcome seven teams as first-time entrants from League1 Ontario and the Canadian Premier League that join six returning teams in our 2019 Battle of the North." Each of the rounds will be contested in a home and away format with the winner being determined by the aggregate score over the two legs. In the event of a tie, away goals will be used to determine the winner. New for 2019, there will be no extra time with kicks from the penalty mark to be used at the end of the second leg to determine the winner. All 13 teams have been assigned a round in which they will enter the competition, with the 2019 Canadian Championship round-by-round match ups to be announced at a later date. The First Qualifying Round will be played on 15 and 22 May and will feature six teams drawn to determine the matchups. PLSQ winners AS Blainville and League1 Ontario winners Vaughan Azzurri will not be drawn against each other. The four Canadian Premier League teams that entered into Canada Soccer membership in 2018, Pacific FC, Cavalry FC, York9 FC and HFX Wanderers FC will join them in the First Qualifying Round. Only AS Blainville are returning to the competition while the other five teams are all making their Canadian Championship debut. The Second Qualifying Round kicks off on 5 June with the return leg on 12 June and will feature the three First Qualifying Round winners, who will be matched up against Canadian Premier League clubs FC Edmonton, Forge FC, and Valour FC. 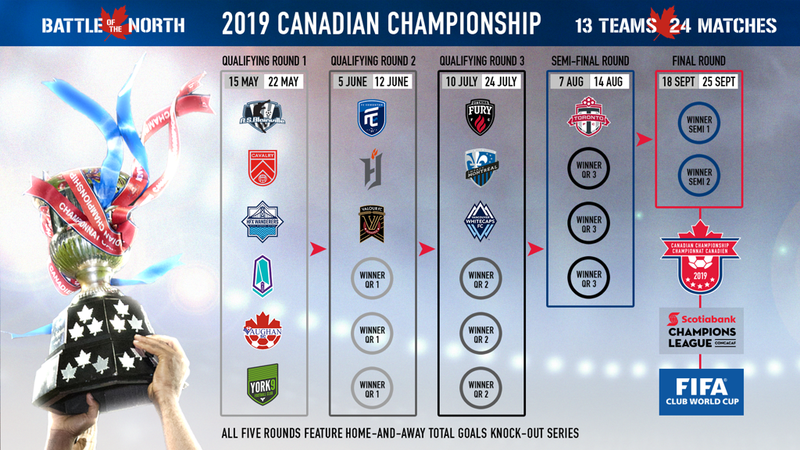 Of note, FC Edmonton returns to the Canadian Championship as a member of the Canadian Premier League and as such are granted a bye to this round. They are joined by Forge FC and Valour FC by virtue of their entry to Canada Soccer as Professional Clubs in Membership in 2017. The Third Qualifying Round will kick off on 10 and 24 July. The Round will feature the three Second Qualifying Round winners drawn against Ottawa Fury FC of the United Soccer League and both Montréal Impact and Vancouver Whitecaps FC from Major League Soccer. The Semi-Final Round (7 and 14 August) will feature three Third Qualifying Round winners plus Toronto FC, who receive a bye to this round as the defending Canadian Championship winners. The two Semi-final winners will then advance to the Final Round which will be contested in a home and away series on 18 and 25 September. Toronto FC, the 2018 Canadian Championship champions and 2018 Scotiabank Concacaf Champions League finalists, will kick off their 2019 Scotiabank Concacaf Champions League run 12 February against Round of 16 opponents Club Atlético Independiente of Panama. Since 2008, three Canadian winners have reached the Quarter-final stage or further in Concacaf Champions League: Toronto FC twice (Semi-finals in 2011-12 and Grand Final in 2018); Impact de Montréal twice (Quarter-finals in 2008-09 and Grand Final in 2014-15); and Vancouver Whitecaps FC (Semi-finals in 2016-17). 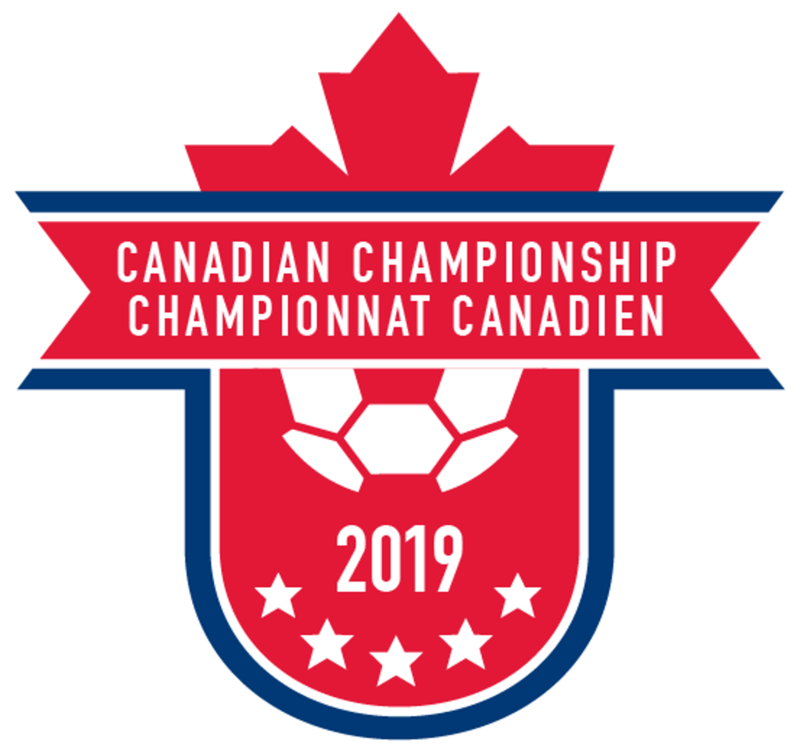 The Canadian Championship is Canada Soccer’s highest domestic professional soccer competition and is the sole qualification route for Canadian professional clubs into Concacaf Champions League and onto the FIFA Club World Cup. Dubbed the Battle of the North, the Championship sets itself apart from all North American professional sports competitions that operate on both sides of the border as the only one to hold an all-Canadian competition that leads to the international stage. Canadian content is a focus of the competition and since 2017, regulations state that each team must field a minimum of three eligible Canadian Internationals as starters for each match. In 2019, the Canadian Championship will feature 13 teams including three Major League Soccer clubs, Toronto FC, Montréal Impact and Vancouver Whitecaps FC; United Soccer League’s Ottawa Fury FC; seven Canadian Premier League clubs, FC Edmonton, Forge FC, Valour FC, Cavalry FC, HFX Wanderers FC, Pacific FC, and York9 FC; Première ligue du Soccer de Québec’s AS Blainville; and League1 Ontario champions Vaughan Azzurri. 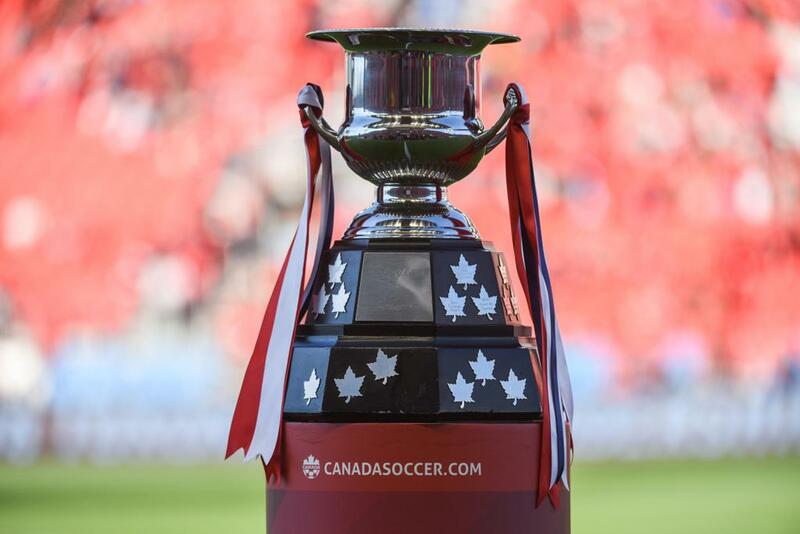 The Voyageurs Cup has been awarded to the Canadian Championship winner since 2008. Created by the Voyageurs Canadian Supporters group, the trophy represents Canadian fans’ commitment to the game in our country. The George Gross Memorial Trophy recognizes the Canadian Championship's Most Valuable Player, with Jonathan Osorio the 2018 winner. The award is named after the late George Gross, an honoured member of the Canada Soccer Hall of Fame.